Aims to improve the customer experience for Open Banking services, particularly apps. Working with the NPSO, we released CoP specifications which are now in industry consultation. Developers can access banks’ customer survey data from banks to build apps enabling customers to be better informed about products and services. Investing app Moneybox announces its integration with Santander – enabling Santander customers to invest their spare change. Clydesdale Bank selects the ID Co to support its mobile banking app, B – enabling its customers to bring all their financial information into one place. Credit-checking company ClearScore announces the launch of OneScore service in Spring 2019 – aiming to give customers detailed insight into their financial situation to prompt mortgage and credit card switching. Information correct as at 31 August 2018. 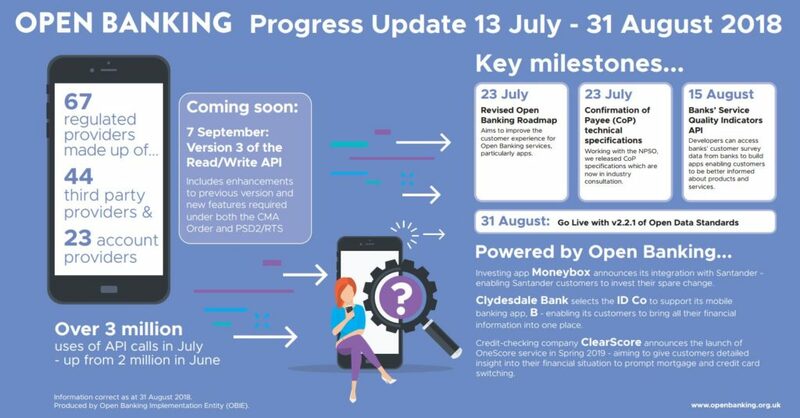 Produced by Open Banking Implementation Entity (OBIE).